Two sisters, Pfeni and Sara, relive childhood games. (Colleen Minahan and Melissa McGlynn). Photo by Steve Atkinson. …hilarious at times, sad, maddening, and totally relatable. Written by the late Wendy Wasserstein, she was an American playwright, of notable pedigree. Her grandfather was also a famous playwright. Ms. Rosenstein writes with humor simultaneously talking about the difficulty facing women in general. She brings attention to the frustrations of life for 3 very well educated Jewish women in the 1990s each choosing a vastly different life. Directed by Shelagh Grasso, Church Hill Theatre’s production is hilarious at times, sad, maddening, and totally relatable. Political references make you know that we all worry about the same things regardless of the decade. Upon entering the theatre, there is a simple set comprised of a living room in which the entire show is staged. Opening with Sara, the birthday “girl’s” daughter, Tess, delightfully played by Shannon Whitaker is working on a school project rolling her eyes as she records a type of biography about her mother. Shannon exemplifies so many young women coming of age, by completely crushing their mother’s carefully planned lives by having ideas of their own. Tess, daughter of a British expat has fallen for a dodgy unsuitable wannabe crusader Tom, played by Nic Carter with the grace and class of John Belushi. Tom, yearns to free his family’s home country of Lithuania, playing to the time frame of the play. The sisters have lost their mother recently, and although she never appears in the show, her presence, like most Jewish mothers, lingers long beyond their lifespans. It is Tess’ mother Sara’s birthday and her sisters, Gorgeous Teitelbaum and Pfeni (changed for intrigue from the name Penny) are coming to celebrate with her in England. Colleen Minahan plays a tightly wound female professional with a very high profile financial job. She is soon contrasted with her more flamboyant sisters. Invited to the festivities, are Pfeni’s boyfriend Geoffrey and a recently widowed Jewish male friend of Geoffrey’s. Merv, played by the ever sweet, handsome and earnest, John Haas who is innocently party crashing. Merv seems to be instantly smitten with Sara. The ability to always take yourself seriously within the confines of a show that is a comedy, demands focus and professionalism. Ms. Minahan stiff posture and crisp diction makes a great contrast to the other characters that slowly and methodically derail Sara’s well-organized world. Will she eventually cave into Merv’s charms? Sporting a 1970s era dress and hairstyle, Melissa McGlynn is lovely as Pfeni, a tantalizing reporter of international human suffering. Geoffrey, her true love deliciously, and charismatically played by John Schratwieser, wants her to stop traveling and grow old with him. However, there is the inconvenient fact; that he is a flamboyantly gay man, suppressing his desires for other men in the midst of the Aids epidemic. Ms. McGlynn’s beauty and grace on stage makes you wonder why she chose a mate that is physically unattainable? Ms. McGlynn’s appeal as a bohemian lifestyle and concern of her choice of mate criticized upon by the more successful Sara. All the while, they agree that they secretly want a mate who knows all the words to showtunes and can give fashion tips. As all the women enter their middle-aged years, no one does it as flamboyantly as “Dr.” Gorgeous Teitelbaum. Now I know what you are thinking, who would actually name their child Gorgeous? Well, being from the Jewish club myself, I can answer this; only a Jewish mother. The name Shana, a common Jewish woman’s name is literally Hebrew for the word gorgeous. I think that the playwright thought that it was as funny as I do. And Gorgeous, played by a fellow member of the tribe, Jen Friedman, is a scene-stealing fiend. I say this with all the admiration in my heart. This character was originally played by Madeline Kahn in the 1992 off-Broadway production. However, if you think you will be disappointed that you weren’t seeing the comedic genius of Madeline, you would be completely wrong! Ms. Friedman is the culmination of confidence, energy as well as her New York accented, gasping while continuing to tell a story, is worth the price of admission alone! And in typical women fashion, each sister with their uniquely wonderful life yearns for certain parts of their sisters’ lives. Set design by Shelagh Grasson and Carmelo Grasso along with their large and talented construction team made it functional as well as a beautiful. Sound designer Chris Grasso creates the desired moods with music and sound effects. Costumes properly are chosen for each of the characters. Pfeni embodies the 1990’s bohemian, while Sara is a tailored professional. You really have to compliment the costume designers, Tina Johnson, Sally Borghardt and Emerson Borghard for the choosing of Gorgeous’ dream outfit. You need to see it to appreciate it. Choreographer Lucia Calloway utilizes Ms. McGlynn and Mr. Schratwieser’s dancing skills as they ballroom dance. I enjoyed the patty cake routine showing how only true friends or sisters learn these silly childhood games. The unsung hero of every great show is the stage manager, and Michelle Christopher does a great job of keeping dozens of details straight. Advisory: Recommended for audiences 12+. 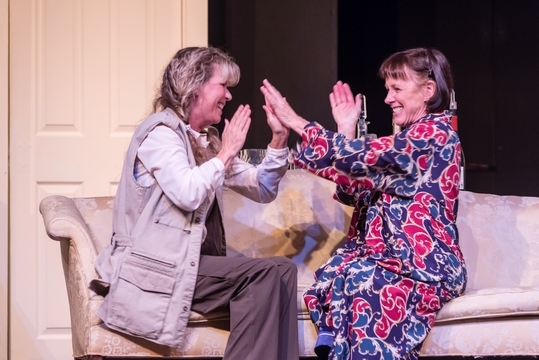 “The Sisters Rosensweig” plays through September 23, 2018 at Church Hill Theatre in Church Hill, MD. For more information and tickets, visit online.